The FUT 19 Swap Items and Deals are now live for January 2019, here’s everything you need to know. 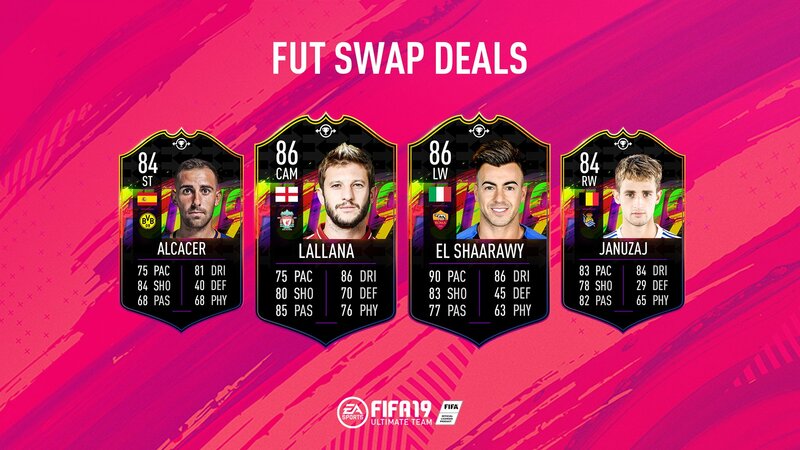 Each month, EA is going to add in a selection of special FUT Swap Cards for players to collect. These cards feature the same stats as their base versions, but have a slightly different design. The cool thing about them is that they can be used to complete certain SBCs, which grant special rewards. It’s all a little confusing, but worry not. We’ve been busy pulling together absolutely everything you need to know about Swap Items in FIFA 19. We’ll list the currently active FUT Swap Item players for January 2019, and also take a look at the rewards you’ll get for completing the Swap SBCs. For more on FIFA 19, be sure to check out our FIFA 19 Guide hub. It’s filled with all kinds of info on the game, including a look at the best young players, some tips on scoring goals, and plenty more. After first being introduced last year, FIFA Swap Items are back for FIFA 19. They’re essentially another card-type to collect, operating as tokens which you can exchange for for rewards. There are 14 of these cards released per month, with the highest rewards in FIFA 19 requiring around 12 Swap Items to redeem. We’ve broken things down below, so that you can start collecting FUT Swap Items and getting some awesome rewards. Note that the current run of Swap Items will only last until February 2, and after that will be completely useless. How to Get FUT Swap Items in FIFA 19? Now that there are FUT Swap Items in FIFA 19, you’ll need to know how to get ahold of them. Luckily, they’re pretty easy to get, as they can be received as rewards when playing a few different modes. We’ve listed all of the ways you can get FUT Swap Items below. What Can You Exchange FUT Swap Items For? Once you’ve collected a few Swap Player Items in FIFA 19, head over to the SBC page to redeem your rewards. 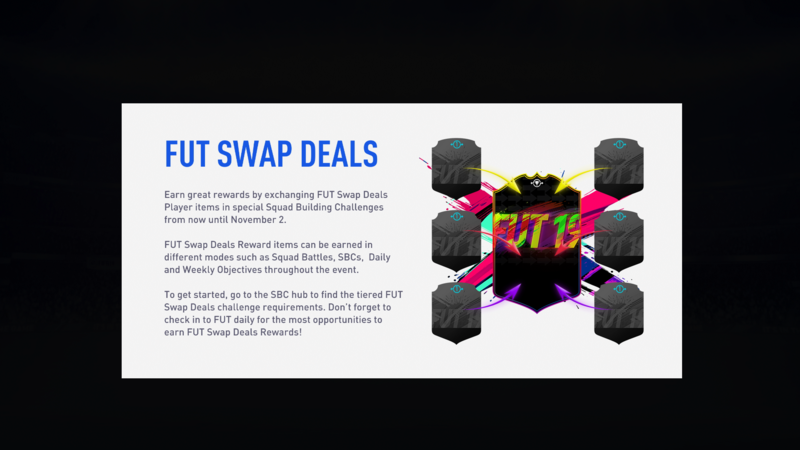 There are specific Swap SBCs offering certain rewards for a certain number of Swap Cards. These rewards range from player picks to extremely valuable Swap Reward Player Cards. Can You Carry Swap Cards Over to Next Month? FUT Swap Items are month-specific, so cannot be used once the current run expires. 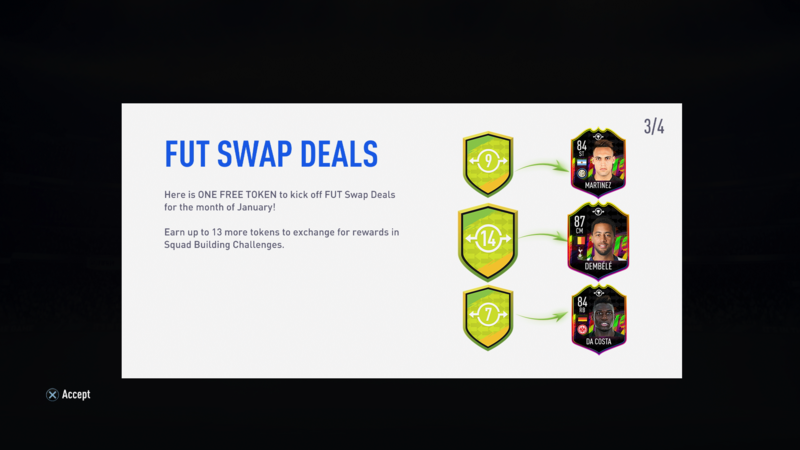 The FUT Swap Items for January will run right up until February 2, at which point 14 new Player Items and 4 new Player Rewards will be added. Your Swap Item Cards will be pretty much useless at that point, so make sure you trade them for rewards.